We've got hold of the latest turn-by-turn app – is it any good? TomTom for iPhone is here, even if it's a little earlier than expected. We thought the company would release it in September alongside its much talked about iPhone cradle, but it seems the advent of other sat-nav apps onto the market has forced TomTom's hand. 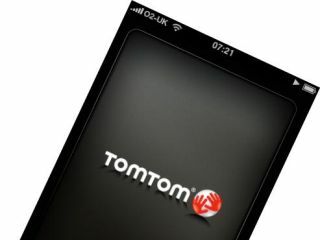 The TomTom iPhone cradle UK release date is likely to be in a few weeks and will bring turn-by-turn directions to the first-gen iPhone and the iPod touch. The iPhone 3G and 3GS are supported by this standalone app. According to TomTom, the car kit will offer "enhanced GPS performance especially in areas where GPS reception is limited" plus a speaker. As you'll hear, the GPS reception on the iPhone isn't perfect and, as such, we're going to wait and give it a full review alongside the car kit to give the full picture. However, that doesn't stop us getting a full hands-on with the actual app right away. The TomTom for iPhone's price, at £60, is a few pounds more expensive than Navigon's Mobile Navigator offering (£53) but over twice the price of ALK's impressive Co-Pilot Live 8 software (£26). Remember these are prices for UK and Ireland mapping products. Like the other apps, all the maps are on-board, so it can work independently of cellular coverage. And certainly when you're in the car, the mapping and sat nav means that the iPhone feels like a normal TomTom unit. Again, everything on the screen adapts to the current orientation of your phone, whether it's in portrait or landscape mode, while the app has more of an iPhone look-and-feel to it than the Co-Pilot software we recently tested. However, it will also feel like home for those used to TomTom navigation devices. Everything is clean looking and well laid out. Getting around the app is a lot easier than the other iPhone navigation apps. Simply tap on a navigation screen to return to the menu. Co-Pilot's in-navigation menu is good, but some of the other apps can leave you wanting – especially when you can't use the iPhone's Home button at all. We were impressed by the advance route planning features (enabling you to set departure time and method). You can perform walking navigation as well as cycling, while you can also restrict your journey with the usual caveats of no toll roads, motorways and more. However, there is very limited speed limit data – though we guess this is a TeleAtlas problem rather than TomTom's.